We have operated in your sector for 35 years. Our TEAM consists of expert international couriers, transporters, and logisticians who have contributed to the successful realization of the BeOne Cloud Forwarding Suite software solution for improving the informative processes of our clients. The history of Nova Systems is distinguished by some important innovative steps that have revolutionized the IT sector and, as a result, also that of the world of transport, shipping, and logistics. From perforated cards and teleprocessing to cloud systems, Nova Systems has always been to the forefront in offering its clients avant-garde solutions which are continually being updated. The latest result of Nova Systems' development centre is the BeOne Cloud Forwarding Suite, the IT solution for international couriers, transporters, and logisticians, with its multiple applications potential, and which is scalable and independent of the size of the businesses. 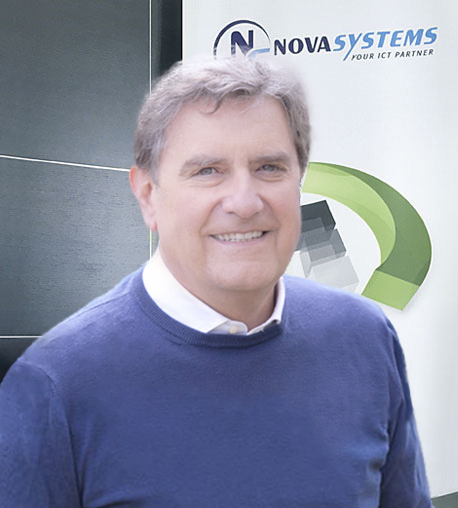 “Valerio Avesani, CEO of Nova Systems, has said that "In any corner of the world connected to the Internet we are present and we can offer our solutions". How did the firm start up? In 1981 a new world of IT applications was opening up. The batch era was ending and that of teleprocessing was starting: computers could at last link up terminals, with real-time transactions, to a central unit. In those years one of the main firms in Italy to have acquired a processor with these characteristics was Centro S.p.a., the data processing centre belonging to Albarelli S.p.a., then a well-known transport firm of which I was head of EDP. The market needed to have these applications and, given that we were among the first to program software with new languages, we were asked to realize systems based on teleprocessing. Consequently in 1981, together with other expert in this field, we founded Nova Systems. Three years later we became a business partner of IBM. Already at the time we used systems that allowed businesses with various branches to be linked, through the networks, to a single central processor. A completely innovative way of working. The firms in the transport and international forwarding sectors were those who were most interested in the system. From teleprocessing to CASE tool and to cloud, Nova Systems' evolution has been characterized by various important innovative steps forward. The basic steps happened in the 1990 when we were the first Italian firm to adopt CASE tool software development, which really was revolutionary at the time. At first we were considered mad by our competitors, but in the space of a few years everyone adopted our solution. However, the real turning point came about in 1998 when we introduced cloud for the first time in Italy. For some time we had been thinking about an international-scale solution and the fact of offering our servicing using cloud computing has led us to this kind of initiative. Nova Systems' main current markets are Italian, Spanish, Portuguese, and Mexican, but our firm, which already has clients in every continent, aims to open to all markets throughout the world. The aim is to create a business that is increasingly international, and that in this way gives work to many people while keeping its capital in Italy.